This is a splendid oral history of a time between World War I and World War II when Jewish athletes were the dominant ethnic group in professional boxing in the United States. The author draws on his own personal experience in New York City's fight arenas, and incorporates interviews with more than thirty former boxers, trainers, managers, promoters, and boxing judges to report on this overlooked aspect of sports history. 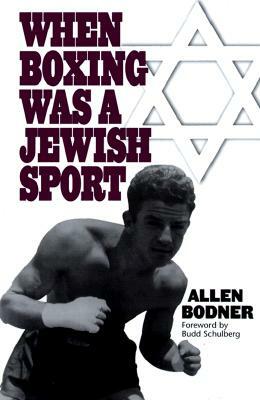 Bodner explores the stories of the Jewish boxers both inside and outside the ring, and also examines their lives as they left the ring to pursue their careers which ranged from fire chiefs to boxing judges to hospital presidents. Boxing was a means many second generation urban immigrants--including Jews--used to get ahead in the early 20th century. The Jewish boxers interviewed reported that they took up fighting to earn money, not to defend their race or negate stereotypes that Jews were weak. These boxers were proud of their heritage and displayed Stars of David on their robes and trunks until religious symbols were banned in the 1940s. During the 1920s nearly one-third of all professional boxers were Jewish, and by 1928, they were the dominant ethnic group in the sport earning 30 World Championship titles between 1910-1940. Bodner's interest in the subject was kindled by his father who was an amateur boxer and professional manager during this period.